Probably one of the greatest adventures you can have in ballooning is to leave this fair isle using the wind currents and arrive on foreign soil. The Channel isn’t that wide and thus France not that far but crossing it requires a lot of careful planning and preparation. 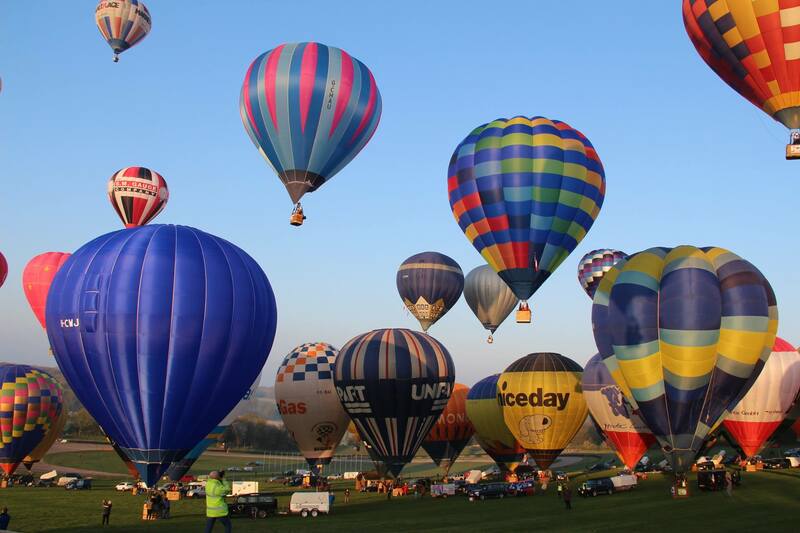 To run an event that looks to try and get approaching 100 balloons across in one go takes a great deal of courage. 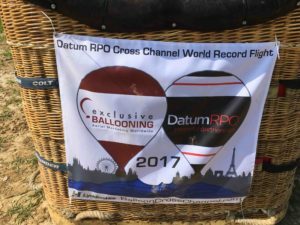 In the event 82 balloons broke the existing record six years to the day since the last mass crossing. There are many tales from pilots and crews alike but all of them will tell you that it was simply great. Keith Storey and Jeff Roberts both have small balloons so were rather limited by the amount of fuel they could carry. So keen were they to have a go at it that they even went as far as trying to buy a balloon! As luck would have it we had Unipart on the shelf and as we tend to fly Prudence these days it was available. In a trice it was in Keith’s van heading for another adventure. Here’s Jeff's story. Or should that be Storey? 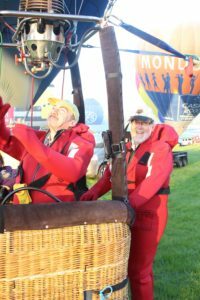 When it was announced that Exclusive Ballooning along with Ian Sharpe and Steve Richards were looking to organise another Channel Crossing, Keith Storey asked if I fancied having a go. After no more than a few minutes of discussions we decided we were both up for it. There was one slight issue in that the balloons we owned, my Thunder 65 and Keith’s Cameron 77 were not really big enough, so the quest began to see what else we could find. We asked around and looked at Zebedee List and the like to see what was available. One day I noticed that the closing date for applications was coming up and we needed to get our application in fast. 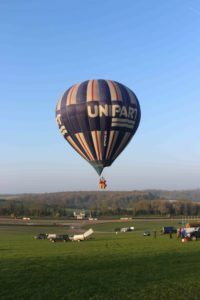 Not having a suitable sized balloon was a bit of a problem but a quick call to Tony Knight and we submitted the application using his balloon registration. We knew we now had to try and find something fast. We saw a Cameron 90 that was on the Zebedee List and made enquiries, unfortunately it had just been sold, so we were back to square one. Then Keith received an email saying that we had a place and needed to finalise our details. At this stage panic set in as we still had no balloon to fly. Knowing those lovely people at Wendover might be able to steer us in the right direction, Keith made a call to Chris and he very generously offered us the use of his Unipart Cameron 105, we were now on! The following few weekends saw us start to get everything sorted, we were going to use my basket and double burner and between us we were going to use an assortment of Keith’s 40 litre tanks and some Worthingtons. While Keith was discussing the flight with Chris he recommended we took four 60 litre tanks, and again helped out with the loan of two. Keith purchased one from Zebedee and, to make up the difference, we would also take a couple of Worthington’s plus one to inflate on. Piece by piece the full kit came together and one calm morning Keith got to inflate the balloon to familiarise himself with it and my burner. It was now a waiting game. On the 14t March an amber alert was announced for Friday 17th March. Direction and speed looked good but there were some concerns about the surface winds which looked to be very gusty for the launch and with these concerns the flight was eventually called off. We were now back to stand by, which gave us more time to organise ourselves. Val found it very amusing watching me try on my immersion suit and kept calling me a ‘Telly Tubby’. Looking at the basket with five tanks in it there didn’t seem to be much room left for the two us with immersion suits on plus sundry kit as well, which included our ‘Big Adventure’ biscuits that Keith had found! The next possible slot was called on for the Sunday 2 April. One slight problem was that Keith was away that weekend working, but contingency plans were put in place for Keith to hand over what he was doing to a colleague. Our crew for the flight, Graham, (Keith’s brother), their neighbour Richard Masters and my wife Val were all ready to go. The Sunday slot was cancelled, not enough wind. The following Tuesday was now looking hopeful, however we were stood down again. Friday 7 April now looked very promising and the flight status was called to green. I managed to grab a couple of hours sleep Thursday evening while Keith raced home from Oxfordshire where he had been working. At two in the morning on Friday we left home and set off for Lydden Hill Race Circuit arriving there around four joining the queue to get in. Once the gate to the launch field had opened our paper work was quickly checked and on to the field we drove. There was plenty of room and we began the task of laying the balloon out. It was a beautiful morning but very cold with a frost on the ground, I was glad of my immersion suit to keep warm! 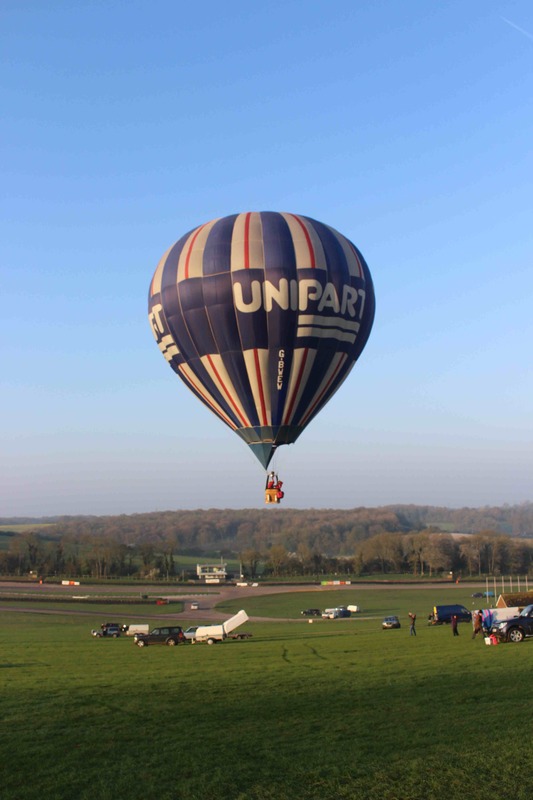 Keith came back from briefing and it was game on as we started to inflate the balloon. 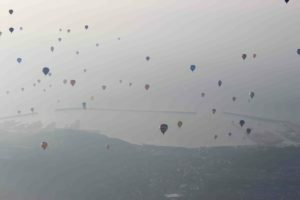 Not quite sure how, but we ended up being one of the last balloons taking off at 07:13 but that gave us a great view of everyone ahead and a good idea of what height we needed to be. At briefing we were told that the ideal direction was at 5,000 feet so we started to climb as soon as we were airborne. As we approached the White Cliffs it was clearly apparent that we were well to the east of the pack and a lot higher so we descended and started to follow the pack. We crossed the Cliffs to the east of the port after being in the air for about 25 minutes and looked out saying ‘France here we come’. Well, hopefully! 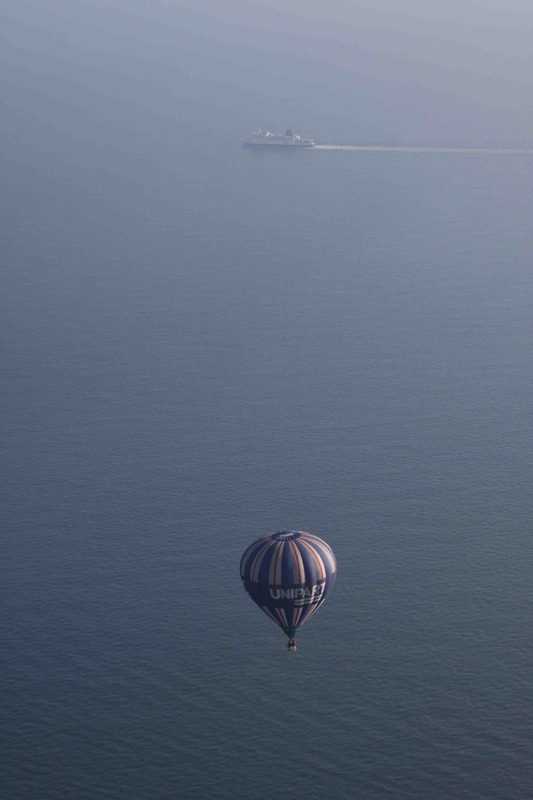 We followed the ferry route and took in the amazing site of 81 other balloons around us. Looking ahead it was misty and there was an inversion that made it difficult to see the coast of France. During the flight Keith managed to manoeuvre us through the pack so we went from the left hand side of everyone to the right hand side crossing closely with Colin Brown and Rowland Benbrook who we had inflated next to us. Only towards the end of the flight did we loose sight of the White Cliffs of Dover but picking out the French coast was difficult. We regularly checked our GPSs and they said we were still going in the right direction and that France was still there despite us not being able to see it! About four to five miles off the coast we eventually saw France, can't say I was relieved but it was very reassuring. We descended as we approached the coast and watched one brave soul go very low as they reached the coast. We opted to stay a bit higher and came in over the coast half way between Sangatte and Wissant two hours after we took off. 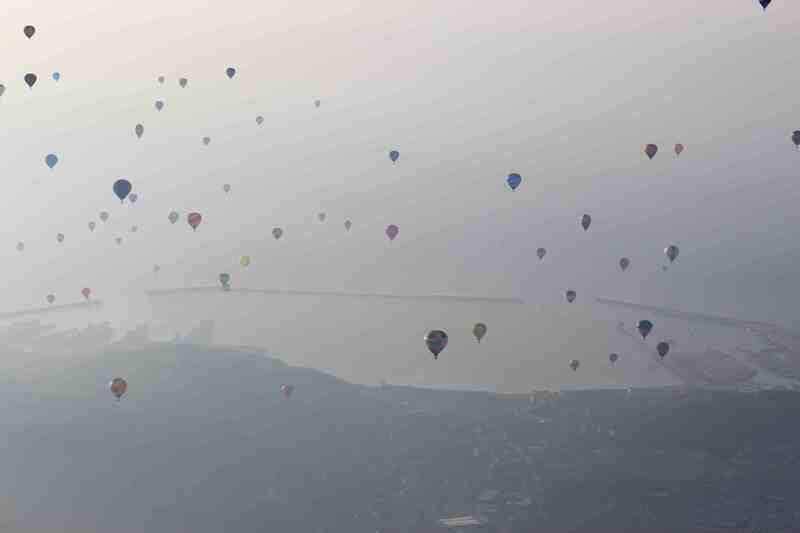 There were lots of people out in the area watching the balloons as we flew over. One of the ‘deals’ we had with Chris was not to land as soon as we crossed the coast but to carry on and enjoy ourselves using up the fuel, so this we did! We came down low to see what the surface winds were doing and they were around six knots, the fastest we had been all flight was 16 knots, so keeping an eye on the ground speed we carried on inland this time following Andrew Holly in the Lord Mayor’s Appeal balloon which was on its maiden flight. With Keith using Andrew as the hare we continued passing over a huge quarry near Ferques. Having been in the air getting on for nearly three hours we started to look for somewhere to land, after a few failed attempts we found a field with a road beside it that looked perfect so down we came, landing at 2 hours 59 minutes and 52 seconds after we took off with Andrew landing about hundred yards to our left. It was after landing that we encountered our first problem, a police helicopter was circling low overhead and was blowing the balloon all over the place making it very difficult for us to deflate it. By this time a few cars had pulled up to watch and what they made of the two of us running around a field in our ‘telly-tubby’ suits I hate to think, I guess they were probably glad that the UK was leaving the EU if that’s how Brits arrive on foreign soil! Eventually we got the balloon deflated and packed away and it was time for something to eat and drink. Keith went off to talk to Andrew to claim our prize for winning the hare and hounds, for which we are still waiting!! Once we were all packed up we posted a couple of pictures on Facebook that included sending a picture to Aidan Murphy in Ireland as we had worn our St. Pio pins to keep us safe on the crossing. Having spoken to Val we knew we were in for a bit of a wait to be retrieved as their allotted ferry time was not until 1pm. Graham, Richard and Val found us around 4pm and we started to tell the tale of our adventure. It seemed like a long journey home finally arriving at our door just after 10pm. What a flight, what a day, something we will remember for ever. 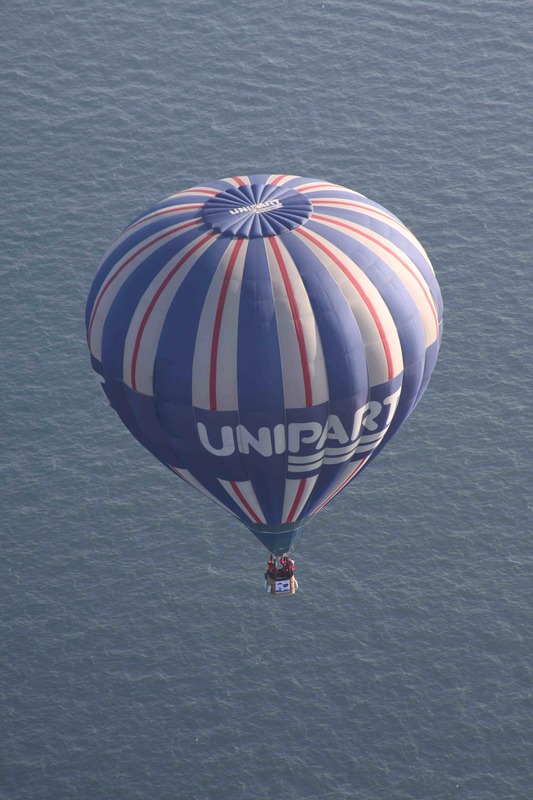 As with most things ballooning we have to rely upon lots of others to help us, so like the Oscars we’d like to thank Chris and Jane for lending us their balloon and for their insight. Graham, Richard and Val for retrieving us. Andrew, Ian, Steve and everyone at Exclusive Ballooning for organising the event and Edward Lubbock, Sue Kidd and Rowland Benbrook for their help and support.